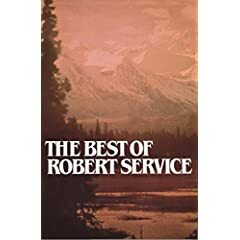 Oh, Robert Service, Oh, why do you insist on having "oh" in oh, so many of your poems? Oh, I suspect it's your way of maintaining your rhythm but oh, by golly, it can get oh, so annoying at times. "Oh, we were happy, were we not?" "Oh, foul or fair he's always there"
"Oh, it set my blood a-boilin'"
Oh, I know when you read the "best of" or "collected works of " any individual poet, you run the risk of getting sick of a style or gimmick you liked when you had read a poem or two in isolation. I almost got sick of e.e. cummings after reading his 100 Selected Poems and that's probably the case here, but oh, my heavens, one more "Oh" and he's about to top Meg Ryan's performance in When Harry Met Sally.